Home Play With Your Food	The Pizza Gallery: Who Says You Can’t Have Pizza? I know, I know… people are constantly swearing off entire kinds of foods all in the name of weight loss, but I’ve got to wonder – if you put “pizza” on your list, was it because you were eating some greasy chain’s pizza, or some re-heatable box pizza? I’m almost certain you weren’t swearing off your own homemade pizza, right? Well, while I gave up everyone else’s pizza, I certainly didn’t swear off my own. But why are my own pizzas so much better than anything else I might find at the store? 1) My pizzas have less salt. I don’t need much more than a pinch of a pinch worth of salt across my entire pizza because it has more than enough flavor. It doesn’t need the salt to give me a reason to keep eating it. 2) My pizzas have less grease. Whereas many other pizza chains insist on dousing their dough in grease to the point where the crust is fried while cooking, I don’t need all that. My dough is flavorful and so are my toppings. I don’t need to cling to fat to give me that “Mmmmmm!” feeling. I’m over that. 3) My pizzas have real ingredients. Do YOU know why there’s trans-fats in Pizza Hut’s pizza dough? Trans fats, the same artery-hardening stuff that killed countless people when the tried to sell that garbage to us as margarine? You DON’T know why that’s in there? Funny. Me neither. 4) My pizzas don’t rely on goo gobs of sweet tomato sauce to make them enjoyable. In fact, the moment I realized that I had a tendency to lean toward making my tomato sauces a little on the sweeter side, I backed off of them completely. 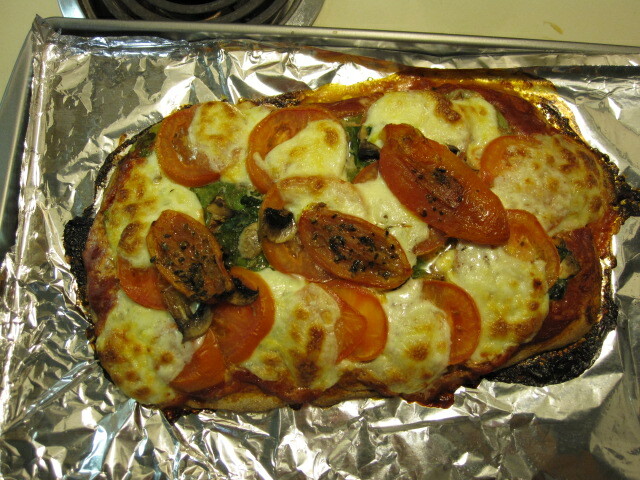 That being said… here are the fruits of my labor, aaaaaaand a reader who shared with me her own pizza-making adventure! White pepper pizza, with black pepper, red peppers, golden peppers, green peppers and zucchini hiding down under white chipotle cheddar. 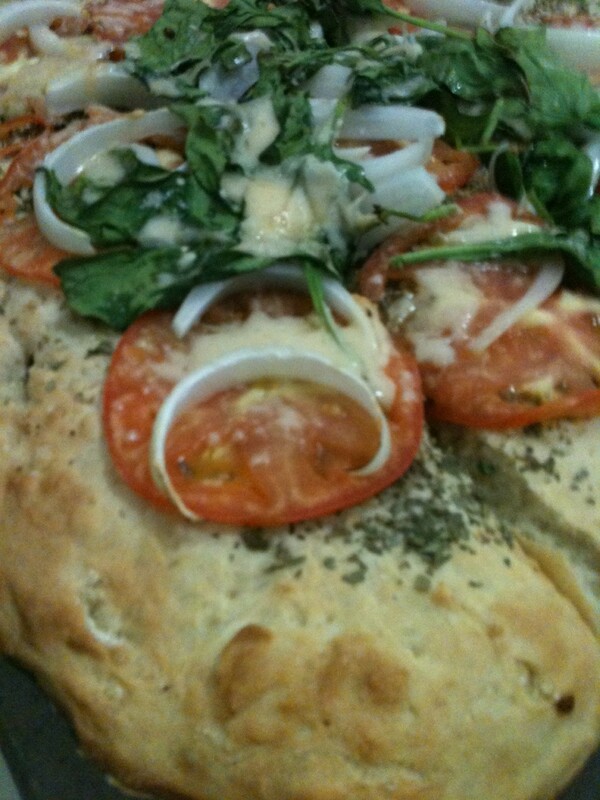 Onion, tomato, cilantro, black pepper, mozzarella, and spinach. 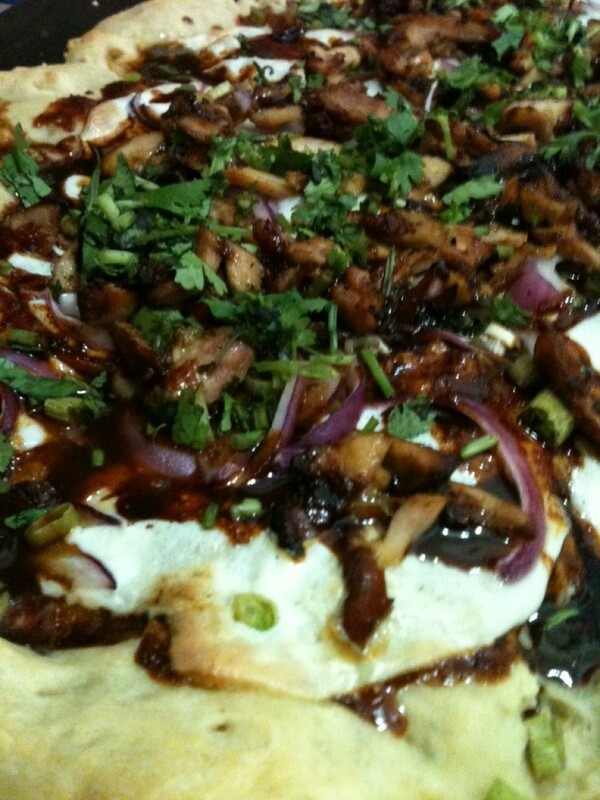 Parsley, spinach, red onion, green onion, mushroom, moscarpone, basil and balsamic vinegar reduction. It was… heavenly. And yes, that is HER giving the thumbs up! If you’re looking to make one of the pizzas above, you’ll need a good dough. While I can’t recommend any pre-made doughs, I can share my recipe for regular dough. If you must go for pre-made dough, look for one with as few chemicals as possible in the ingredients list, and as little salt as you can get! What’s your favorite kind of pizza? Shoot, give me some ideas! BGG2WL In NYC: How Do You Remain Active While On Vacation? I bought a whole wheat pizza dough from trader joe’s and made a goat cheese/fig pizza. I may have a pic somewhere. I’ try and dig it out. Have you all tried Cauliflower pizza? Its so good! I found the recipe on-line and its so good! The dough is made of shredded cauliflower, egg beaters and flax seed and its divine. 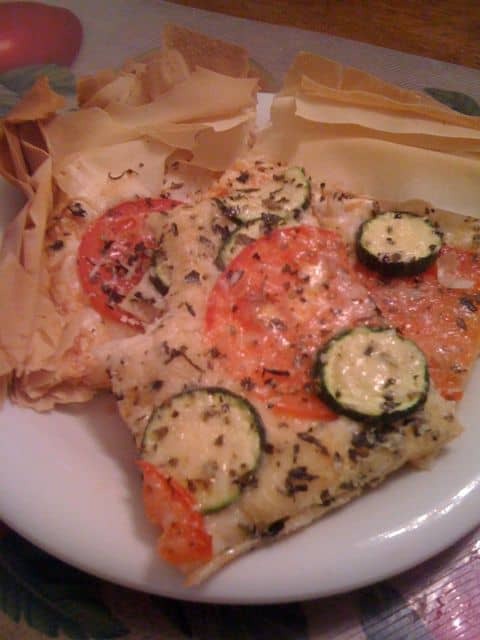 I use fresh mozzerella so its not completely low-calorie but its better than real pizza dough and great for vegetarians! Not a big fan of egg beaters around here, but will definitely have to look into that. Sounds interesting! I use the pre-made dough from Trader Joe’s (in the refrigerator section). They have a regular one, a whole wheat one, and a Basil one. I cut it in fourths and put them in the freezer. 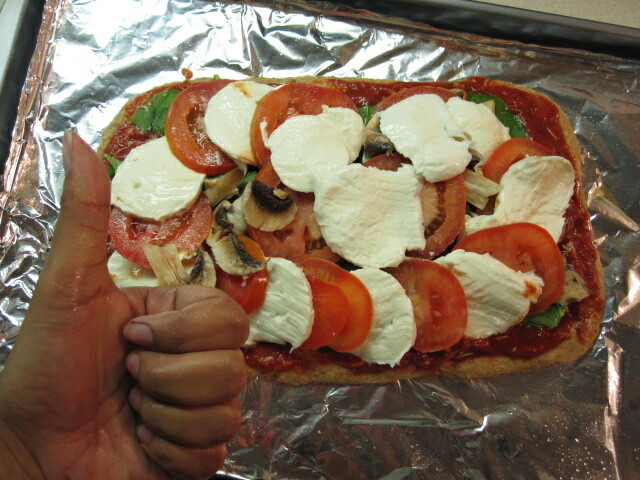 When I want pizza I pull one out, defrost it, stretch it out, pre bake it a little bit and throw on my toppings. Been doing this for years! I haven’t had a dominoes or pizza hut pizza ever since! Made my first pizza last night and the kids loved it!!!! Oh my goodness all of the pizzas look yum…I had in the past made my own pizza but reverted back to Domino’s Pizza. Pizza is my weakness. I could eat pizza 3 times a day, everyday, for a week. Sadly I have been known to eat a whole medium pizza in 1 night. It’s my addiction. If I dont take a few pieces and put the rest in the fridge immediately it will be gone before bedtime. Last year I found a pizza recipe that I LOVE. You use Hummus instead of tomato sauce (i use store bought but you could make your own), and whatever veggies you like. I usually put broccoli, mushrooms and yellow and red peppers. Sprinkle some cheese and bake at 475 for 15-20 min (or until dough is cooked). 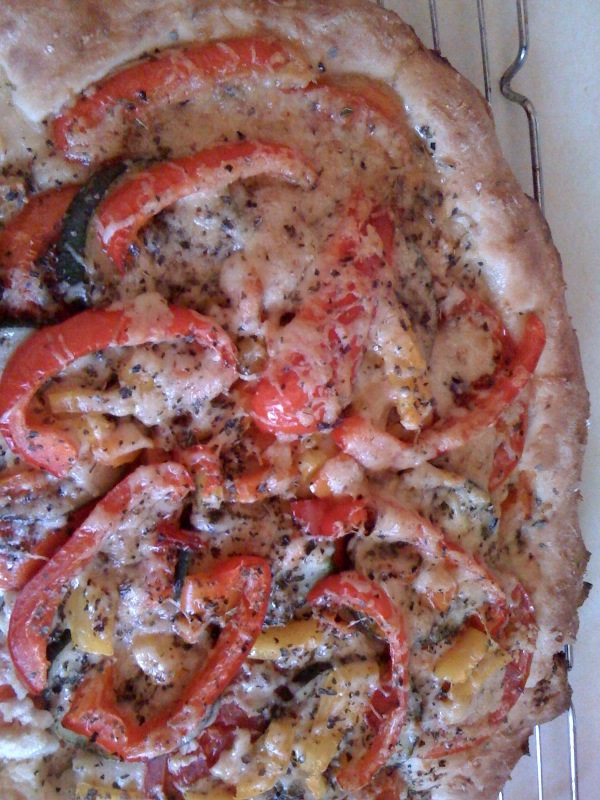 Voila yummy veggie pizza. I like your hummus idea, I’ll have to give that a try. Thank you for the idea! 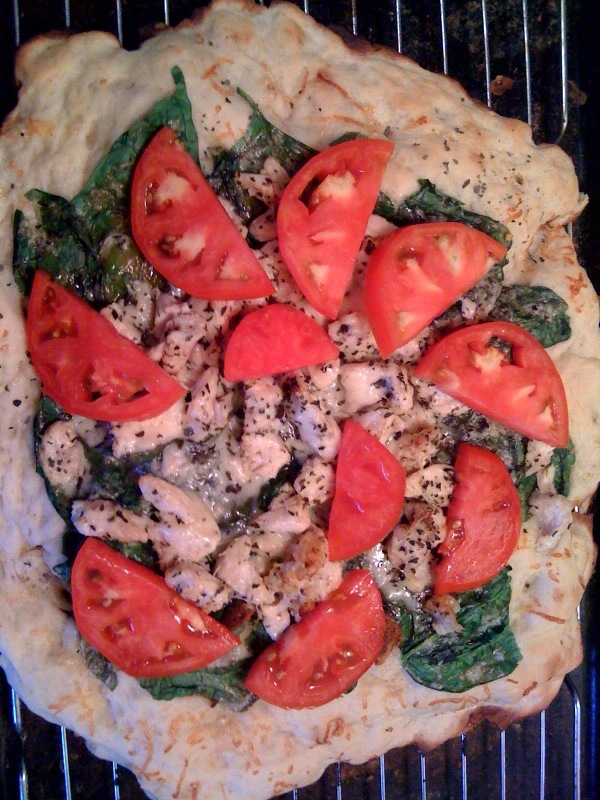 I am diagnosed gluten sensitive/intolerant, so I make my own using alternative flours to wheat, oat, barley…My favorite pizza toppings are grilled chicken, spinach, roasted red peppers with asiago and mozzarella cheese.. This is a good alternative and suggestion…thanks! I stuff halved peppers with pizza topping and bake. That’s my simple version of pizza.